Changing America: The Emancipation Proclamation, 1863 and the March on Washington, 1963 is presented by the Smithsonian’s National Museum of African American History and Culture and the National Museum of American History in collaboration with the American Library Association Public Programs Office. The exhibition is made possible by the National Endowment for the Humanities (NEH) and is part of NEH’s Bridging Cultures initiative, Created Equal: America’s Civil Rights Struggle, which encourages communities across the country to revisit and reflect on the long history of the struggle for civil rights in America. To accompany the physical exhibit, I, along with two of my colleagues, worked to develop a digital companion website, called Changing America Rhode Island, that localizes and contextualizes the narratives present in the exhibit’s panels. The website can be viewed at www.changingamerica-cssj.org. • To expand the narrative created by the Smithsonian’s national exhibit. • To weave this narrative together with Rhode Island’s history and resources. • To connect the history of the Emancipation Proclamation and the March on Washington to contemporary stories of ongoing resistance struggles. We created the website with the hope that it will continue to be developed and built upon with the help of future scholars who work with the Center for the Study of Slavery and Justice. The homepage presents viewers with two initial tracks, 1863 and 1963, in order to keep the narrative in line with the years highlighted in the physical exhibit. After choosing a year, viewers are presented with a short introduction to each section, along with the option to view the “National” or the “Local” narrative. Each narrative track brings viewers to a horizontal scrolling page in which they are led through objects, images, and documents that frame the Emancipation Proclamation, the March on Washington, and other sites of black struggle within a broader spatial and temporal context. With the “1863 National” narrative, we wanted to present an alternative “story” that expanded on the Emancipation Proclamation and President Lincoln’s legacy. This section of the website features images and texts from the document’s drafting process, it’s signing, and its memorialization in American culture. 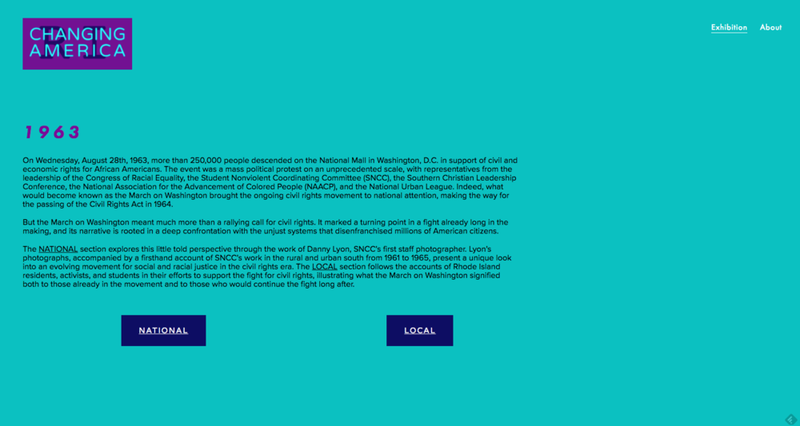 Above is a screenshot from the website of three artistic iterations of the Emancipation Proclamation that we thought were evocative of the mainstream valorization of Lincoln as the “Great Emancipator.” This is juxtaposed against texts illustrating resistance from black abolitionists who were against the Proclamation altogether. The “1863 Local” track discusses Rhode Island’s history with anti-slavery, as well as the realities of Reconstruction in the North that led to the emergence of the Jim Crow laws. The narrative begins in 1830s with the emergence of the Rhode Island Anti-slavery Society, and heavily features documents and images from Elizabeth Buffum Chace, who was a prominent Rhode Island abolitionist at the time. The narrative then moves to discuss Rhode Island during the Civil War; the picture to the left of the screenshot above shows soldiers mounting steam boats in Exchange Plaza in Providence to go fight in the war. Finally, we end with the realities of Reconstruction—although some African Americans may have gained prosperity after the war, there were many like Mary Johnson who remained socially immobile. Images courtesy of the Rhode Island Historical Society. The “1963 National” track exclusively features images taken by Danny Lyon while he was the unofficial—and then official—staff photographer for the Student Nonviolent Coordinating Committee. These images provide a close complement to the national narrative of the physical exhibit, as they show an expanded context for the March on Washington and highlight what happened “on the ground.” All the images featured are courtesy of the David Winton Bell Gallery at Brown University. With the “1963 Local” narrative, we wanted to feature the participation and efforts of Rhode Islanders during the Civil Rights era. The resources from this track were the most diverse, as we illustrate the struggles of African Americans in Rhode Island through photographic image, newspaper clippings, memos from the Urban League, and various pamphlets and demographic information. All content was created on the Squarespace web platform. Squarespace provided us with the best design elements that would showcase our exhibit as a “visual experience,” much like walking through a museum gallery. The archival and secondary research for this project was conducted both through physical and digital resources. Secondary readings for most sections were completed through a combination of physical and digital books and encyclopedias. However, secondary contextualization for the “1963 National” narrative was adapted exclusively through Danny Lyon’s photographic memoir, Memories of the Southern Civil Rights Movement (Chapel Hill: University of North Carolina Press, 1992). Archival research was completed with help from the Brown Digital Repository, as well as through the physical collections of the following organizations: the Rhode Island Historical Society, the David Winton Bell Gallery at Brown University, the John Hay Library at Brown University, and the Providence Public Library.